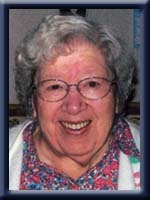 MOSHER – Doris M., 90, of Sable River, formerly of Sandy Cove, passed away peacefully in South Shore Regional Hospital, Bridgewater, Saturday, April 14th, 2012. Born in Bridgewater, she was a daughter of the late John and Beatrice (Hubley) Labrador. Doris was very active in her community providing Meals on Wheels and was a member of the Liverpool Seniors Group as well as Trinity Anglican Church. She was also a member of the A.C.W. She enjoyed crafting such as painting, quilting, crocheting and sewing and sewed for a time for Suttles and Seawinds. She is survived by her step-daughters Verna Mellor of Weymouth, Pauline Wilson-Burton of Digby, Madeline Wills-Brown (Randall Brown) of Sable River. Her step-sons Douglas (June) Tingley of Sable River and Leonard (Leora) Tingley of Digby. Many step-grandchildren, step-great grandchildren and step-great-great grandchildren. Her sisters Louise VanNorden of Milton and Mary Weagle of Chelsea. Her brother Edward (Joan) Labrador of Bridgewater. She was predeceased by her first husband Howard Tingley, her second husband Neil Mosher; step-sons Lester Tingley, Clifton Tingley and Vincent Tingley, step-grandson Wade; sisters Jean Wentzell and Agnes Morash and brothers Donald, Frank, John Jr. and Charles. My heart goes out to the family of Dot . Her second marriage was to our Uncle Neil. Dot was a special lady and loved to live life to its fullest.I have many good memories of her, shopping,playing cards,camping.I hope she is in a better place now and no longer in pain…May god bless….She will never be forgotten…. I will miss my sister Doris greatly. So very sorry to hear of Aunt Doris’s passing, please except our heart felt condolences in this your time of grief. It is hard to lose a loved one at any time, our thought and prayers are with you all in this difficult time. My condolences to the family. Sorry to hear about aunt Doris. She was a wonderful lady always ready to help in anyway she could. Very sad to hear about Doris’s passing. She was a great lady and always had a smile. She will certainly be missed. My condolences to the family. So, Sorry to hear of Dot’s passing. Dot and Neil were the best of neighbours and friends,many good times playing cards, at Dot’s,Mary’s and Roxie’s.Our condolences to the family. Take Care. So very sorry to hear of Dot’s passing. We are so sorry for your loss and I know you will miss her terribly. Dot lived a good life and was loved by all who knew her. Her spirit will continue to shine and will leave all of us with an example to follow and a remarkable life to remember with grateful hearts. Have very fond memories of all the time I spent with Dot and Howard. To Aunts Mary and Louise and Uncle Eddie…..
She seems to have been one of those amazing people who have a great capacity to enjoy life and share that enjoyment with others. She will be missed by many but likely even more by you, her brother and sisters.